Acho....The one and only Real Murcia....Pijo! : Sunday's Final....on the CHEAP! - Sunday: from 17:30 until the game starts at 18.45, at the box office (on the opposite side of the ground to the main entrance. 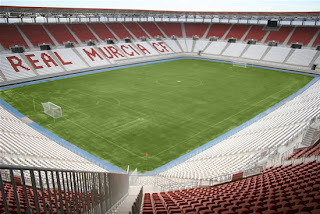 You know the score.....the New Condomina is just north of Murcia with easy access from the A-7 motorway. The best stadium in spanish football, excellent sightlines from wherever, easy parking, increasingly noisy fans and and increasingly better team. We are on the up.....so brits...forget Elche, Hercules or Cartagena and get yer backside down the the New Condomina! Hahaha! very good! I may need your support to bring the "British army" fan block out of the dark side!